ingredients: as many hot peppers as you want to ferment (I used 1 lb. of sweet/spicy Italian Peppers and Cayenne) 1 cup whey (you can look into vegan alternatives for ferment starters online) at least 4 T sea salt Maple Crystals , to taste to create: 1. Make a mash! Blend up all hot peppers in a food processor and dump into a clean crock or glass jar. 2. Stir in whey and sea salt. 3. Cover with a towel and leave for 5-7 days, depending on temperature outside and how fast it is fermenting. You can tell that IT'S ALIIIIIIIVE! and fermenting as little bubbles rise up to the top. If a white film begins to develop on the top, scoop it off. It is usually harmless kahm yeast. Now, the magic has only begun! 4. Strain the mash through cheesecloth into a bottle of your choice. (Do you hoard jars like I do? Use an old hot sauce bottle! 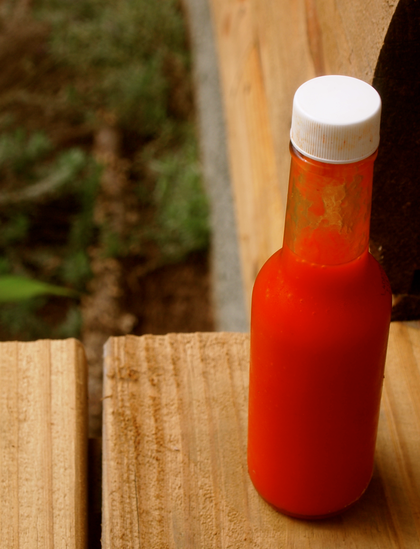 The drip drip drop drop is ideal for this spicy condiment!) 5. Add a few pinches of Maple Crystals… taste.. prime? Shake it up and drip the glory on all your favorite savory flavas! Not balanced? Add a little more. You can even add garlic, carrots, or other herbs to influence the flavor to your tastebud's delight! 6. Store in fridge, as this will slow down/pause fermentation. Easily keeps for months! HOT, HOT, HOT! Awesome! Thanks. 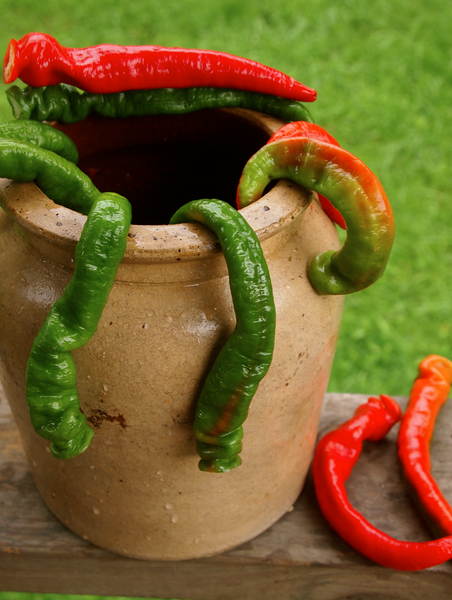 I have many hot peppers and am always looking for new ways to use them.